This issue isn’t important just because Erik Larsen had the foresight to draw Namor flying around with the X-Men (something the Sub-Mariner wouldn’t regularly do until about twenty years after this was published). I know that Iron Man is in this picture as well, but lets assume that he has relapsed into alcoholism and stumbled into the frame. What is most important is that it’s the debut of Steve Ditko’s final marvel creation—Squirrel Girl! Before she became a nanny/babysitter for Power Man and Jessica Jones, she turned up in this quarterly special. Ditko introduces the rodent powered hero in a short feature with Iron Man. He’s been kidnapped by Doctor Doom, and the only person he can call for help is Squirrel Girl. The character is just so ridiculous, with her only being able to communicate with squirrels (in particularly, her favorite who is named Monkey Joe) and some other squirrely powers. See what I did there? Early in the story, she’s pleading to be Iron Man’s sidekick, but he keeps blowing her off. The poor girl is clueless. But Squirrel Girl proves her worth when she calls for some backup–Monkey Joe and about a thousand of his little furry friends. They subdue and in turn wind up humiliating Doctor Doom. She’s a really goofy character and reminds me of Sue Heck from The Middle with her constant cheeriness. The whole thing is just so absurd to the point that you have to imagine that it made Ditko either really mad or he immensely enjoyed the story. The rest of the book has some fun stuff, involving the X-Men trying to stop a half-human, half-Sentinel who has gone out of control, Namor making making some bird-like friends, and a bunch of Jim Starlin. So should you buy this? Only if you are a speculator waiting for Squirrel Girl: The Movie. No really, it’s a fun anthology and great for some light reading. 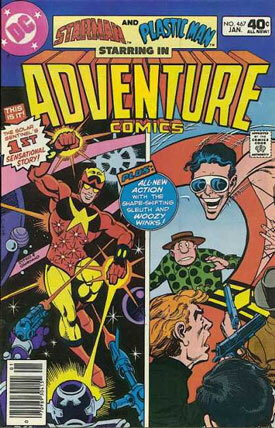 Adventure Comics was a long running anthology series from DC. Issues #467-469 caught my attention due one of the features being the debut of the Prince Gavyn incarnation of Starman. 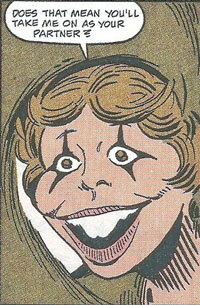 I was drawn to this not because of the character, but more because it was Steve Ditko work from the 1980s. After reading the Steve Ditko book, I’ve had a lot of interest in this period of his career which is very hit or miss. But in these issues, Ditko was on fire. The script is by Paul Levitz, who wrote a lot of DC’s more cosmic stories during this period. Gavyn is a prince from the intergalactic empire of Throneworld, and after developing powers he was exiled into deep space while his evil and corrupt sister ascends to the throne. As Starman, he comes back to try to liberate his people. It’s what you would expect from a science fiction/fantasy/super hero comic book from this time. One cool thing about the story is that Starman’s origin isn’t explained till the third appearance of the character. I liked that because you already had a sense about him before that was all explained. And, I guess another reason why I really wanted to pick these up was because of the Gavyn figure I have from the Justice League Unlimited line that Mattel put out during the mid 2000s. I felt obligated to learn a little more about a character that I wasn’t familiar with. The other stories in these issues feature Plastic Man, which are pretty silly and kid friendly. I think that’s because this would be the time that the character was horrifying a generation of children on a Saturday morning cartoon show. This might be a conversation for another day. So today at work, I got into a discussion with someone about comic books. This guy knew his stuff, and we mainly spoke about the work of Steve Ditko, Bill Mantlo and Gene Colan. The best part of this conversation was that I got to walk away having learned something! Did you know that the late Gene Colan patterned his Dracula after Jack Palance? I certainly didn’t. The actor portrayed the world’s most famous blood sucker in a made-for-television film in 1974, and he became the basis of Colan’s take on the character! Not that I doubted the gentleman, but I did a little verifying on the Internet and this is one you can mark as true. Who knew? 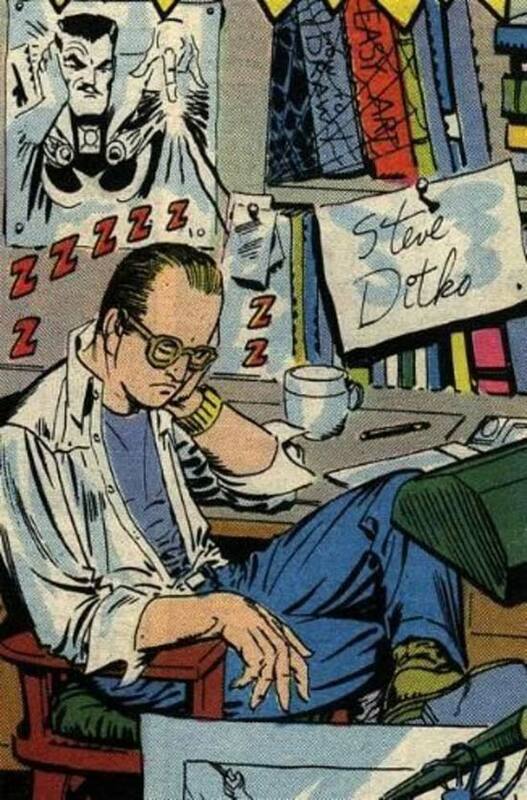 Today we celebrate the 84th birthday of one of comics legend Steve Ditko! The ever-elusive creator of Spider-Man enjoys his privacy and probably wouldn’t want us to acknowledge his birth, but that won’t stop us from talking about some of his best contributions to comics! Let’s look at some of Ditko’s better known creations. You can’t argue that Spider-Man isn’t Ditko’s most successful project. Here’s a clip from an interview with Stan Lee where he talks about what he feels was Ditko’s best work from their run on Amazing Spider-Man. Over at DC, Ditko created the super hero brother duo Hawk and Dove. One peace-loving, the other war mongering, the Hall brothers made their first appearance in June 1968’s Showcase #75. Dial B for Blog has a great account of their creation. Ditko also created the Creeper, an outspoken talk show host who moonlights as a psychotic super hero. Simply put, the Creeper is insane. 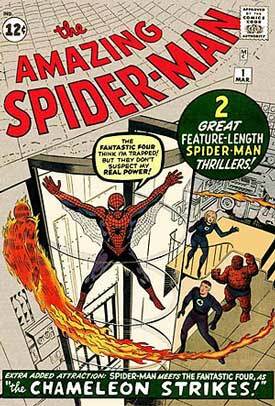 HyperDave at Data Junkie put together a great retrospective of Ditko’s run. Also during this run at DC, Ditko created Shade the Changing Man, a new Starman and the Stalker. I’m not going to go too much into them, as I really haven’t been exposed to them enough. During this time, Ditko did some phenomenal stuff over at Charlton, creating the original Captain Atom and the Ted Kord version of Blue Beetle, both of which became key staples in DC’s Justice League International books. 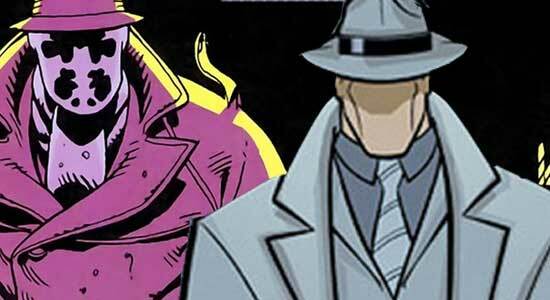 He also created reporter turned faceless vigilante the Question. Eric Newsom runs an invaluable resource on the character, filled with analysis, interviews and commentary about the faceless hero. Ditko went on to create a more hardline, Ayn Rand influenced version of the Question called Mr. A. The great people at Dial B for Blog have a much better description of the character. This is just the tip of the iceberg; there’s much more non-super hero work in his bibliography. Keep in mind, Ditko’s career began in 1953, and he’s still creating stuff to this day. He remains super elusive and doesn’t give interviews. 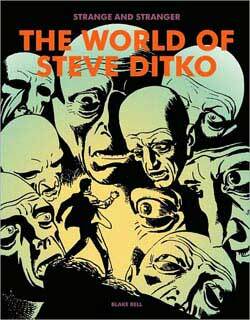 If you would like more information about Ditko’s career, there was a great book Strange and Stranger: The World of Steve Ditko that chronicles his career, as well as the BBC documentary In Search of Steve Ditko. You can find clips on YouTube. On a final Ditko note, when you research his works and his life its hard to miss mentions of the influence of philosopher Ayn Rand. At one point, he even pitched adapting her novel Atlas Shrugged to Marvel. So in a bit of Ditko magic, my work day began with me taking a pile of Rand’s books–including Atlas Shrugged–from the free book pile in the staff room. I think its fitting; if Ditko had a birthday party, I’m sure that would be his party favor of choice. When I picked up Blake Bell’s Strange and Stranger: The World of Steve Ditko, I figured I would learn more about the comic book creator. Instead, after finishing this book, I only have more questions. This isn’t a shortcoming of the author; his subject is just that complex. Bell shares a glimpse into the mind of Ditko, someone who is very important in the history of American comics but at the same time is more elusive and mysterious than the Question–a character he created. So what did I learn about Ditko? By the time you finish Strange and Stranger, you learn what motivated Ditko. It’s not fame and fortune, or other forms of personal success. It’s following the Ayn Rand philosophy of objectivism. So what’s that? So what does that mean and how does it apply to Ditko? Basically, he had his own strong sense of what was right and wrong, and he would only do things on his own terms. This strong sense of black and white in his worldview is what influenced his career. Bell shares many stories from Ditko’s peers–and excerpts from the artist–that show how they shaped his business decisions, for better or worse. Bell does a great job of showing how the characters created by Ditko incorporated objectivist theory, like how Hawk and Dove may have differing theories on how to get there but ultimately coming to the same conclusion of what is right. I can now look back at his work on the Creeper and the Question and see how this influences the characters’ actions. I also was introduced to Ditko’s Mr. A, a somewhat more sinister and objective version of the Question, who wasn’t afraid to take a life of a criminal. Even if you don’t agree with them, you can’t help but not respect Ditko’s decisions. He is a man who would rather lose personal success then compromise his personal values. 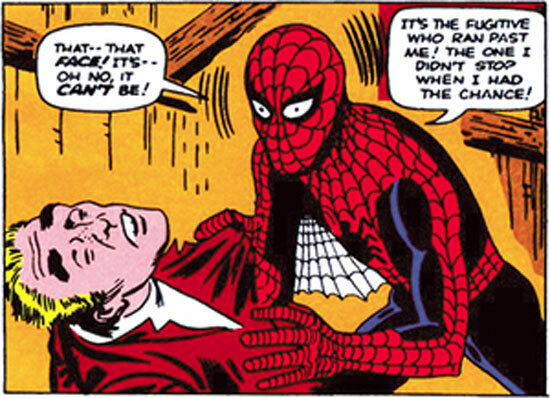 This is evident in the tale of Frank Miller wanting to collaborate on a Mr. A project, but Ditko refusing since Miller didn’t share the same views on the character. So ultimately, I’m more intrigued about Steve Ditko than ever before thanks to this book b y Blake Bell. Does anyone have any recommendations of where I should start?